Get the latest and greatest from Tölt News - get the calendar!! You can either get it with your ‘super’ subscription, or you can order it individually through Magcloud. See all of the details here below. 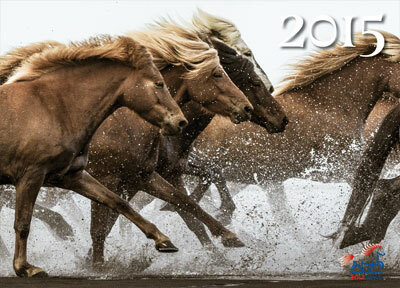 The calendar will come out around the same time as the fall/winter issue and will be filled with photos from within our Icelandic horse community. Anyone and everyone can submit their photos to be considered for the calendar (yearly deadline of September 15). We have a panel that then selects the photos that will grace the cover and every month of the calendar. We will do this every year. We invite you to submit your photos! Photo submissions must be in by November 1st of every year. Please send them to tolt@toltnews.com attn: calendar photos. If you did not receive a calendar, or would like extra copies, it’s as easy as 1-2-3 to get a copy or two or ten! Please go to www.magcloud.com and search “Tolt News” in the upper right hand corner and you will see both the calendars and back issues that are available for purchase. Once you’ve selected the calendar that you want to purchase, you can flip through it before purchase or you can simply purchase it. You are also able to purchase one, two or a hundred copies - the magic of print-on-demand! The calendar should arrive in your mailbox from Magcloud in about a week’s time.